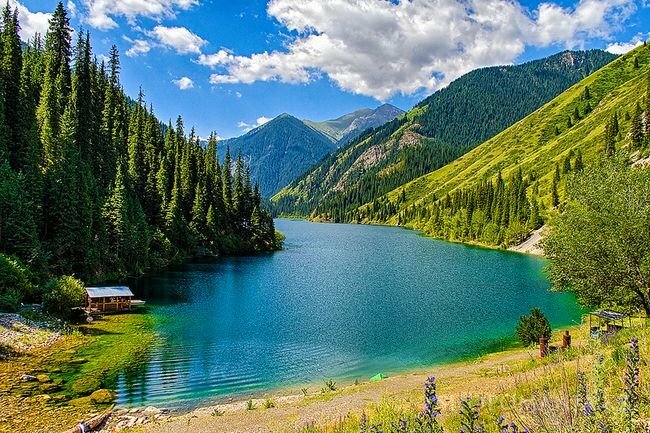 South Kazakhstan is indescribably beautiful. 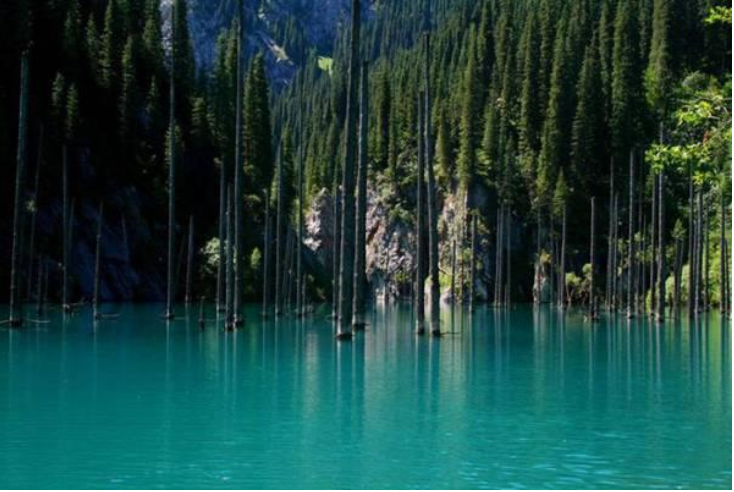 We offer you a three-day trekking tour of the picturesque lakes. You may wonder what secrets do Kaindy Lake hide in its depths? In fact, the peaks sticking out of the water are the dry tops of the birches. The trees themselves, as you might guess, were “drowned” in a mountain lake. In any other place, they would have rotted long ago, but the cold water of Kaiyndy (even in July, not higher than 6 ° C), literally keeps them preserved. Birches are perfectly visible through the water on sunny days. Braves can even walk along the paths of this fabulous underwater. 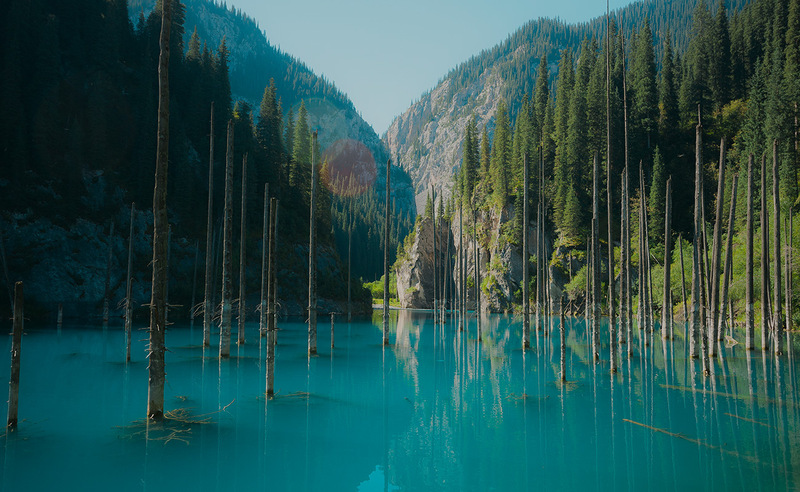 The name Kaiyndy in kazakh language means that there are birches. At first, we will go to the Kolsay-1 lake. Lake Kolsai-1 is clamped in a narrow gorge. The firs here are not only higher than on other lakes but also water is much warmer. Here people can try mountain strawberries and go fishing. The Upper Kolsai is at 2850 m above. Kolsai-1 is the biggest out of the 3 lakes. We will trek around the lake in order to enjoy the beauty of the lake from all angles. We will trek at untrodden paths where hawthorn, wild strawberries grow. After trekking appr. 5 km around Kolsai lake we return to Saty village. After several hours of walking along the western gorge, you will reach the second lake – Kolsai-2 (N-2252). This lake is heart-shaped. Activities there: picking mushrooms in the forests together with feasting your eyes on sunset, smell flowers and grass at the same time, also admire rainbow trout jumping out of the water. Additionally, you can take a walk as well as ride a horse, and it’s even nicer if your load carries a horse, you can walk alongside and enjoy the beauty of nature. And ahead of you is the smallest and coldest of the three lakes-brothers – Kolsai-3 (H-2900). It is surrounded by magnificent rocky coasts, overgrown with luxurious bushes. This lake ends with a magnificent ensemble created by nature itself. Not everyone can go to this lake and therefore it is the cleanest and untouched. The one who is lucky enough to visit these places will never forget their splendour, silence and tranquillity around. When the water surface is calm, it reflects the sky and the enchanting panorama of the mountain landscape. Arrival in the village at lunch time. We are located in a cozy guest house. Dinner. After Lunch we go to the Kaiyndy lake. From Saty village we drive 20 km to Kaiyndy lake where we spend a quality time trekking there. Early in the morning after breakfast (prepare by our guide) we will go to the 3rd lake. Upon finishing trekking on Kolsai 3, we depart back to Almaty.